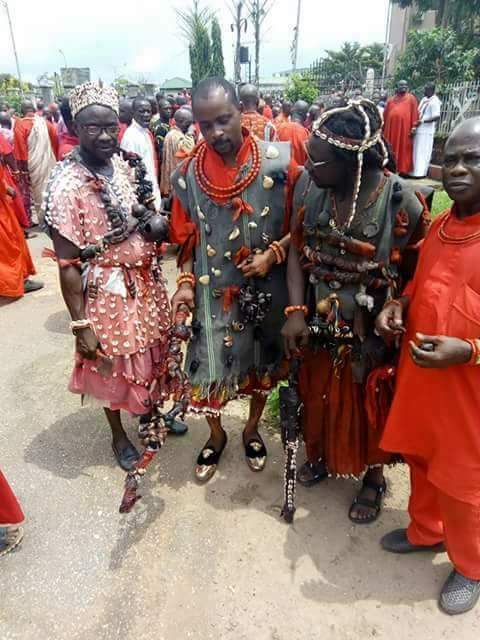 The Benin Monarch, Oba Ewuare II, on Friday assembled sorcerers and top magic-practicing priests of the Kingdom to place curses on native doctors and herbalists and all others who aid human traffickers by administering oaths of secrecy on their victims. Also cursed were kidnappers, violators of the order banning Community Development Associations and others whose business is to initiate sons and daughters of the kingdom into various cult groups. Those who carried out the swearing exercise were the Ohen Okhuae, Ohen Ovia, Ohen n’Oriyekeogba, Ohen Ake, Ohen Niwuo, Native Doctors, Ohen Sango, Odionwere, Iwueki and the Enigies. It would also be recalled that the Director-General of the National Agency for the Prohibition of Trafficking in Persons (NAPTIP), Dame Julie Okah-Donli, had during a visit to the Benin monarch a few weeks ago, disclosed that the agency found it difficult to prosecute offenders because the victims were not willing to come to court to testify against their traffickers due to the oaths of secrecy administered on them. 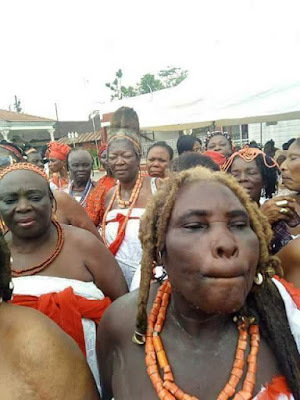 Oba Ewuare in his remark during the ceremony, said those aiding and abetting human trafficking through the use of black magic and subjecting them to the oaths of secrecies should desist from it henceforth or face the wrath of the gods. “You native doctors whose business is to subject people to the oath of secrecies and encouraging this evil act on the land, you have to repent, stop doing it. This is not a joking matter and if you do not repent, you have to wait for the repercussion,” he said. The Monarch noted that the palace is not against those practicing sorcery, but seriously frowned at those who use it to perpetrate evil in the land through aiding and abetting human trafficking in the State. He said henceforth those who were under oaths of secrecy administered on them by human traffickers had been set free and at liberty to air their views and reveal their sponsors without fear of any harm from their sponsors. “We want to use this medium to tell those who are under any oaths of secrecy that they are now free. We revoke the oaths today,” he said. The Royal father said the interest of the palace was to work for the development and progress of the State, adding that all hands must be on deck to work towards that direction by doing what is right. “What the Palace stands for is peace and the development of the state. I want to use this medium to tell you that the act of using charms to aid trafficking, the palace seriously frowns at it. “We want us to join hands together to fight against human trafficking in the land,” he said, noting that there had been positive reports​ about Edo State and that such positive reports​ must be sustained. The Oba who disclosed that the State Governor, Mr. Godwin Obaseki, pleaded with him to help reduce the spate of human trafficking in the State, added that before now, he has been in the vanguard against human trafficking in the State. Meanwhile, the Director-General of NAPTIP, Dame Julie Okah-Donli, has hailed the Benin Monarch, Oba Ewuare II, for placing curses on human traffickers and their colaborators. Speaking to our PMNews correspondent at the palace of the Benin Monarch, Okah-Donli, who was represented by the Edo State Commander of NAPTIP, Barr. Nduka Nwawwenne, expressed confidence that the curse placed on those aiding and abetting human trafficking will reduce​ the scourge of trafficking in persons. She added that the agency hoped it would witness improved prosecution of trafficking offenders henceforth. “The major reason is that victims of human trafficking who are supposed to give evidence in court don’t usually open up because of the oath of secrecy they have taken.